The name fforest camp probably conjures up images of fields and canvas and an outdoor summery vibe, and you're not far wrong. 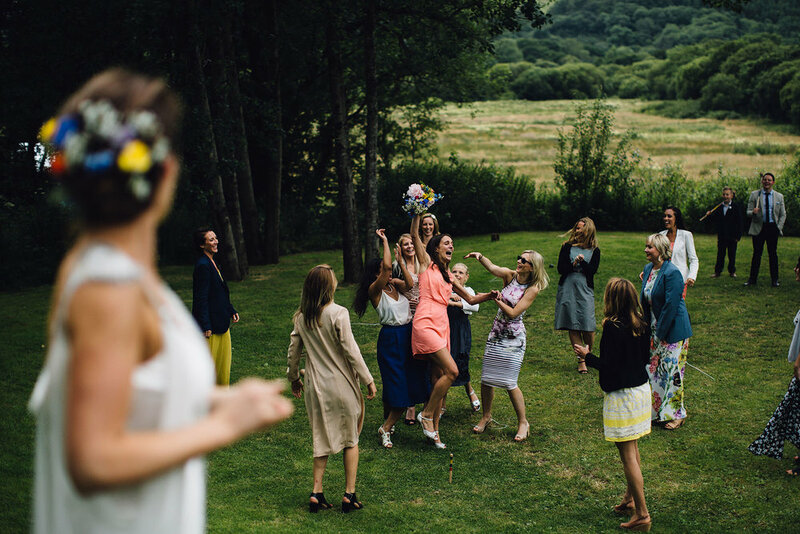 But there is so much more to fforest, and here are 10 very good reasons why it’s a great choice for a cosy winter wedding weekend with family and friends. Winter has its own palette. Subtle shades of white, blue and grey, which lend themselves beautifully as the backdrop to the soft pastels or rich jewel colours of a winter wedding. 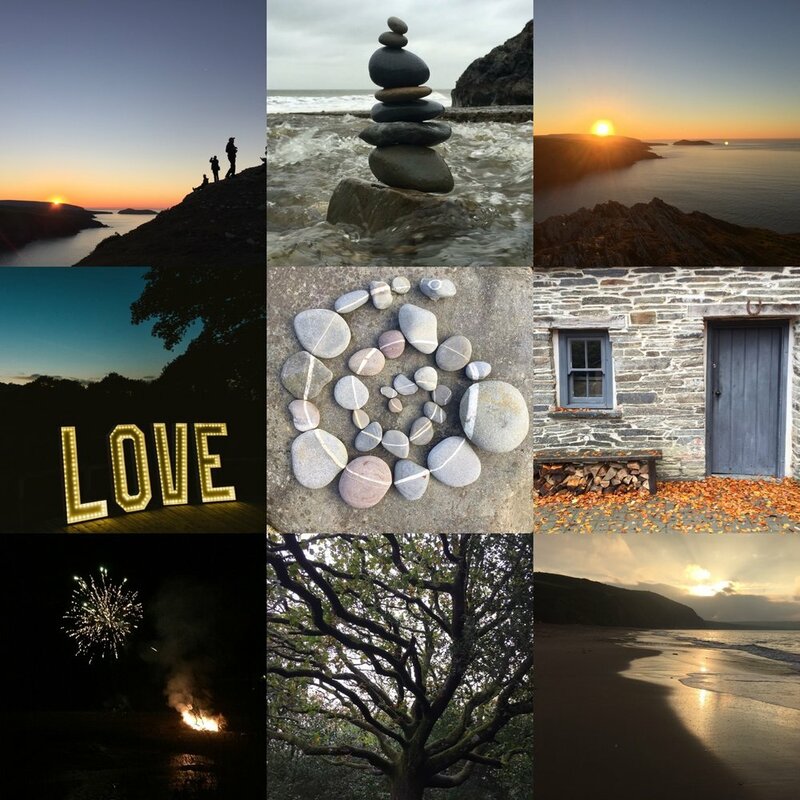 The clear crisp Pembrokeshire skies make you want to get outside and embrace the elements. 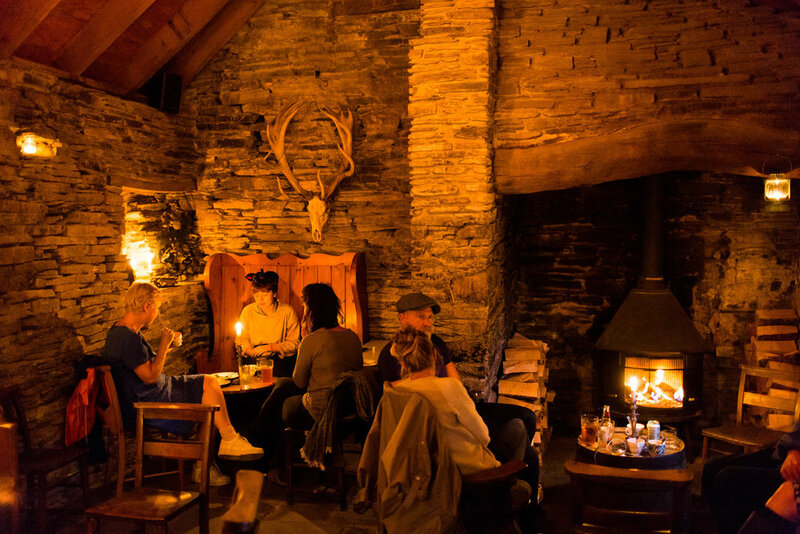 There’s a magical private pub at the heart of fforest, exclusively for the use of you and your guests. 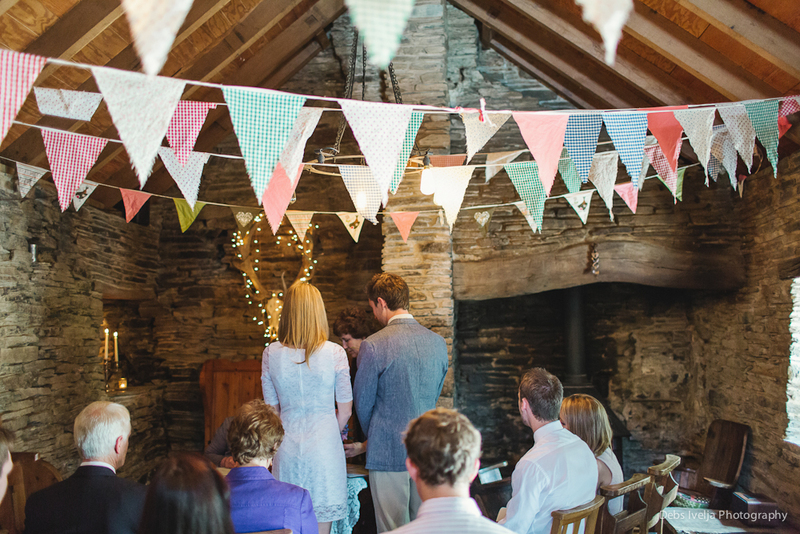 It also has a licence enabling you to get married in front of the inglenook fireplace. If the weather is against you it won’t matter as you go straight from ceremony to celebration without even having to step outside. 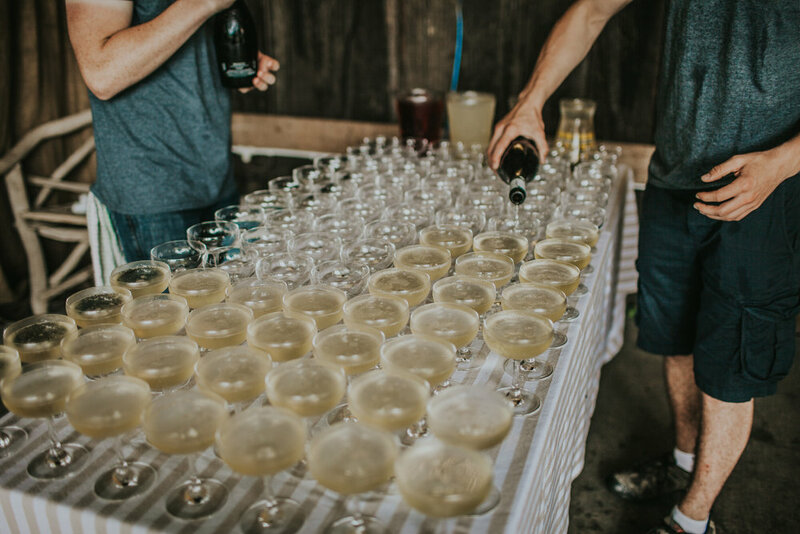 Your guests can toast you with a fforest winter cocktail which, whether warm or spicy, will be guaranteed to kick-start the festivities. fforest food is seasonal and local, so with a winter wedding comes an appropriate change in menu. Slow-roasted lamb from our wood-fired oven with lovingly prepared locally grown vegetables, a table full of colourful sharing platters or a comforting tagine. The opportunities to create a memorable, intimate culinary experience for your celebration are limitless. Not so much fine dining, rather the best private dinner party you’ve ever hosted. When the natural light starts to fade, fforest lighting comes into its own – candles and lanterns dotted around the heart of the camp, tealight chandeliers in the pub, festoon lighting along the pathways and the stunning heartwood halos in the farmhouse and domes, made from ancient heartwood from the standing dead branches of fforest oak trees. The farmyard at fforest has ample en-suite accommodation for 30 resident guests in the newly renovated farmhouse and old stone crog lofts. The geodesic domes can be added as a romantic option, able to accommodate another 4 couples, with room for small children. For larger families and groups of friends, the katacabins have five single beds round a central stove with a covered outside seating area. 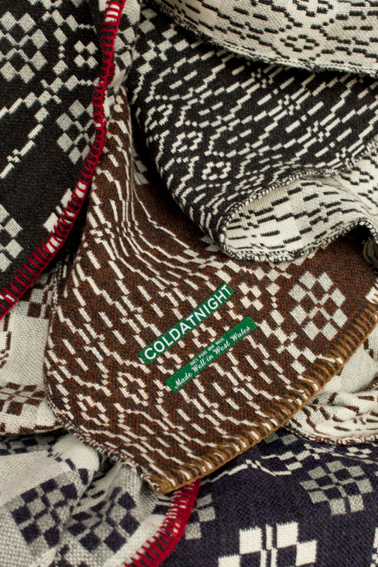 Wherever there’s a sofa or bed at fforest, there’s a coldatnight Welsh blanket, designed by Sian, co-founder of fforest, and woven up-river at a traditional woolen mill. Being surrounded by beautiful Welsh textiles gives a satisfying sense of place and there is no better time to appreciate a fforest blanket than when it’s crisp and fresh outside and you’re warm and toasty inside. 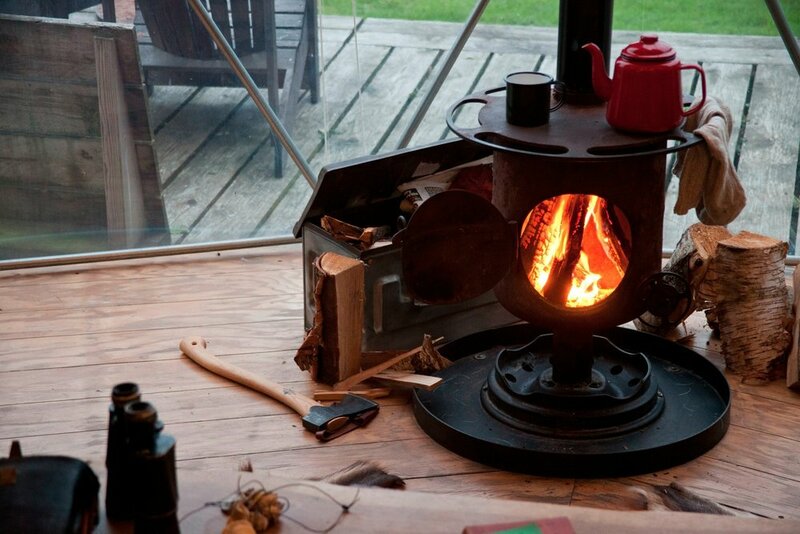 Even in the height of summer we can’t wait for the sun to go down and the temperature to drop so that we can gather together some kindling and logs and start up a roaring fire. Whether it’s outdoor braziers, indoor wood-burning stoves or the big communal covered firepit, we are all drawn to the warmth and glow of a real fire and at fforest there is no shortage of them. fforest is on the Pembrokeshire / Ceredigion border, adjacent to the Teifi Marshes Nature Reserve and the magnificent Teifi gorge, and a short drive from the All Wales Coast Path. The area is stunning all year round, but in winter you often find you have a beach all to yourselves. The light is breathtaking and begs to be photographed. Saunas are amazing at any time, but they were designed to be appreciated when it’s at its coldest outside. Ours is made from sweet scented cedar and heated with a wood fire. For the brave, there’s a cold shower outside too. “There are no strangers here, just friends you haven‘t met yet“. No matter what time of year you visit, you will find the fforest elves are just as busy as their famous namesakes. 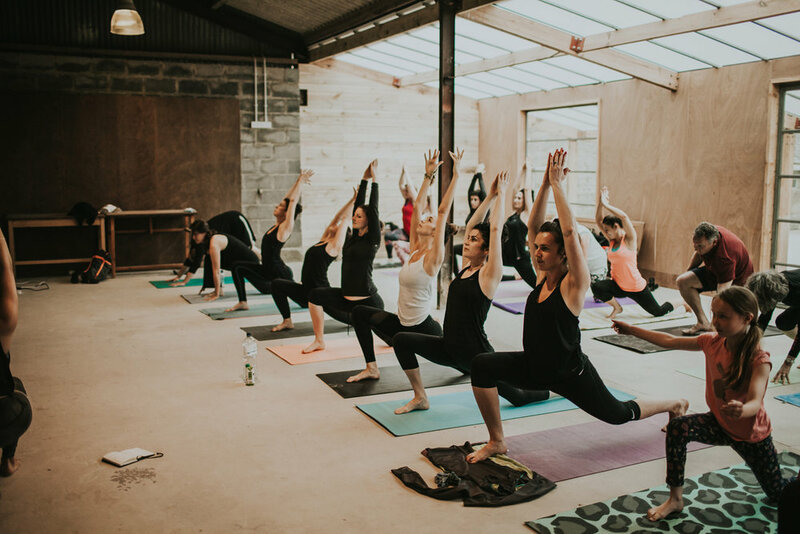 fforest is not short of wonderful assets, but the fforest elves are undoubtedly what completes the experience, receiving constant praise for their knowledge, skill and unobtrusive service. And by the time you leave you’ll all be on first name terms. 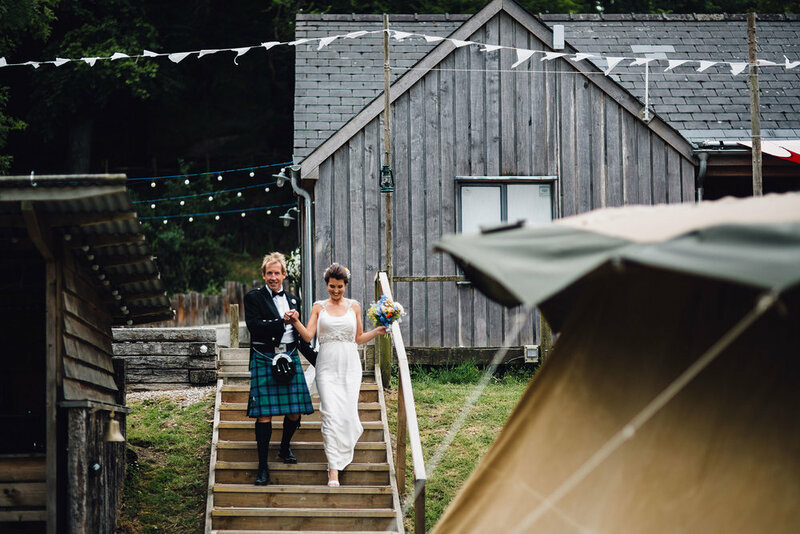 Here's a sample day-by-day account of a fforest Coast wedding. 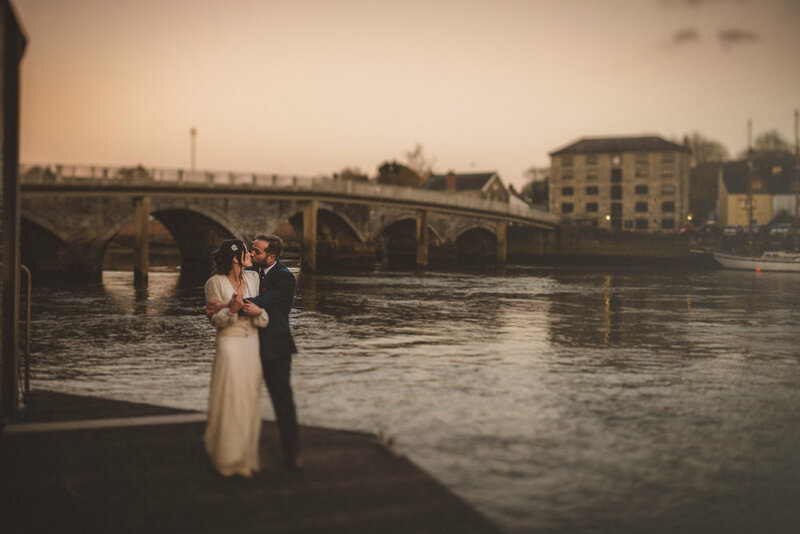 With the final preparations for your wedding day completed, you are free to welcome your guests while you relax with a drink on the terrace. Catch up with old friends, watch the sun go down, enjoy the slow-cooked, simple, local, supper we have prepared for you before retiring to the firepit for more chatting and laughter. After an early morning fforest breakfast, your guests wander down to the beach take a breath, have a dip, a cliff walk, or be first back for the the cedar barrel sauna, while you start preparing for the day ahead. 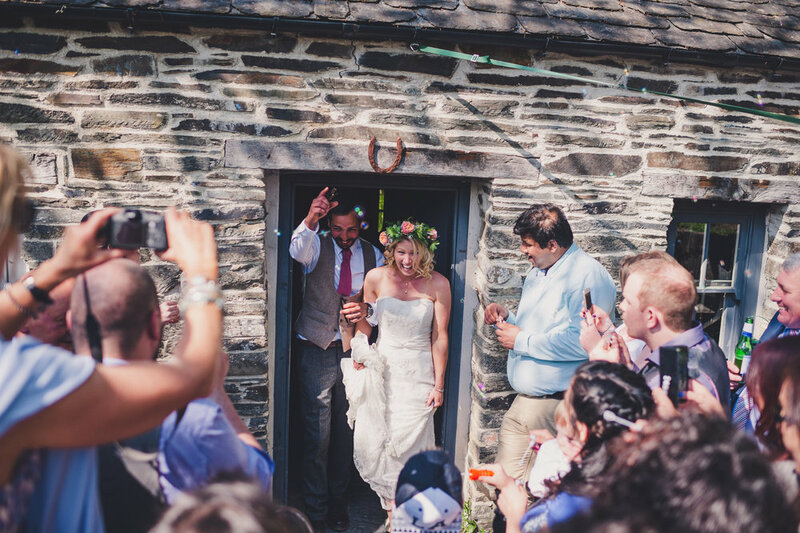 You all gather for your wedding celebration in the vintage marquee followed by champagne and canapes on the terrace.You have time for a quick dash to Penbryn beach for the perfect wedding day photo opportunity before rejoining your guests for a decadent tea party in the big Dutch barn rounded off with speeches and toasts. Out on the terrace, there’s more chatting and relaxing until the sun sets, the firebowls are lit and the fforest elves light up the barbecue to start preparing herby barbecue chicken ready for your supper. 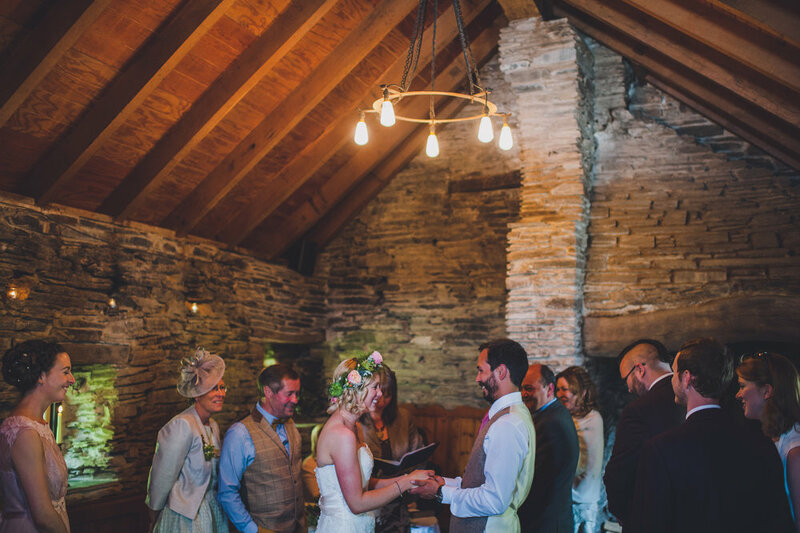 Then dancing shoes on for a ceilidh in the barn. As the young and old drift off, the last ones standing wander down to the firepit for a last reminisce before bed. Early risers can have a fforest breakfast, but for the majority it will be a mid-morning reviving fforest barbecue brunch. (Bloody Mary anyone?) Time to relax before saying your goodbyes. 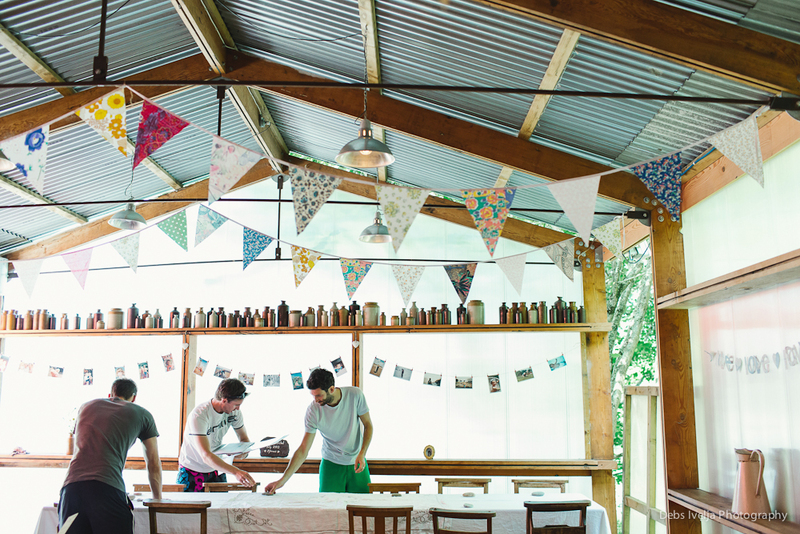 A wedding at fforest Farm is a weekend long celebration. We will guide you to the best use of the variety of spaces available to you, but ultimately the shape of the weekend is up to you. 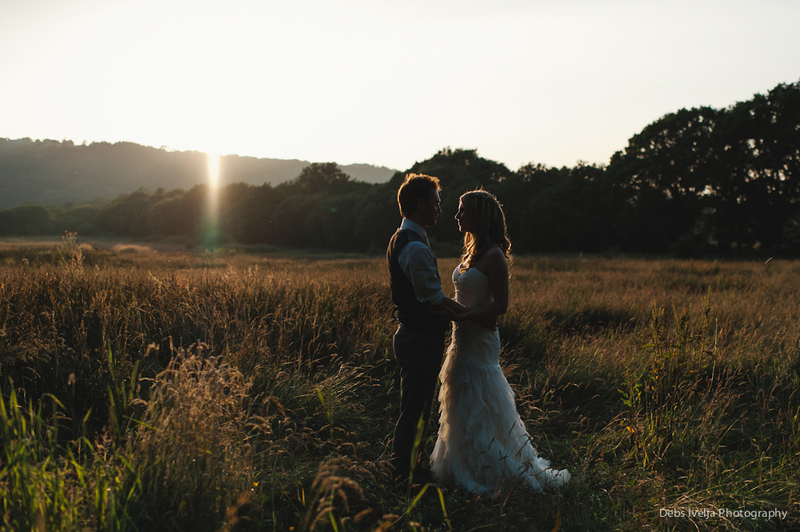 Here is our day-by-day account of a fforest farm wedding. The final touches have been made to your decor and you’re relaxing on the lodge terrace, ready to start welcoming your guests. 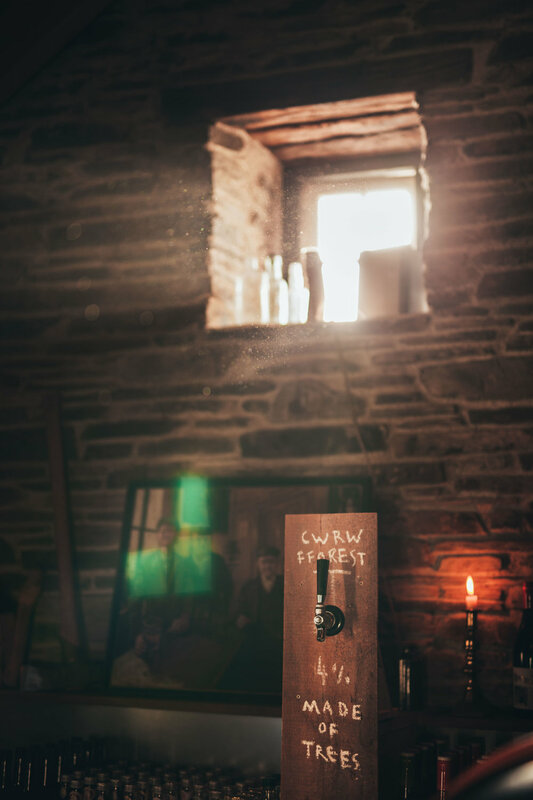 After check in everyone pops down to join you for a drink in the Bwthyn pub before a delicious informal supper wood-fired pizza party. After sunset everyone cwtches around the firepit, where chatting and drinking continues until bedtime. You’re awake at the crack of dawn and we have the tea brewed and waiting for you down at the lodge. Other early risers can go for a river swim or a run through the woods before joining you for breakfast. 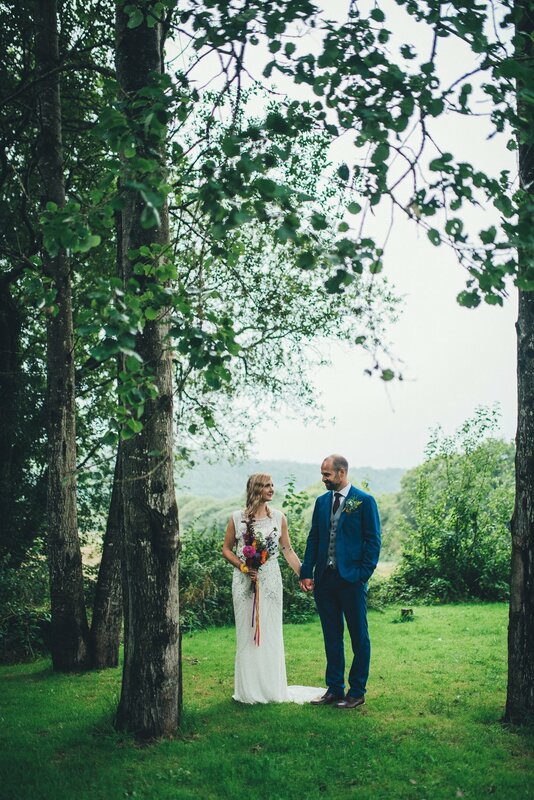 While you’re busy getting ready, your guests can go for a stroll through the nature reserve or take a guided canoe trip through the Teifi gorge. It’s back to the pub! But this time for an intimate civil wedding ceremony for your closest family and friends. 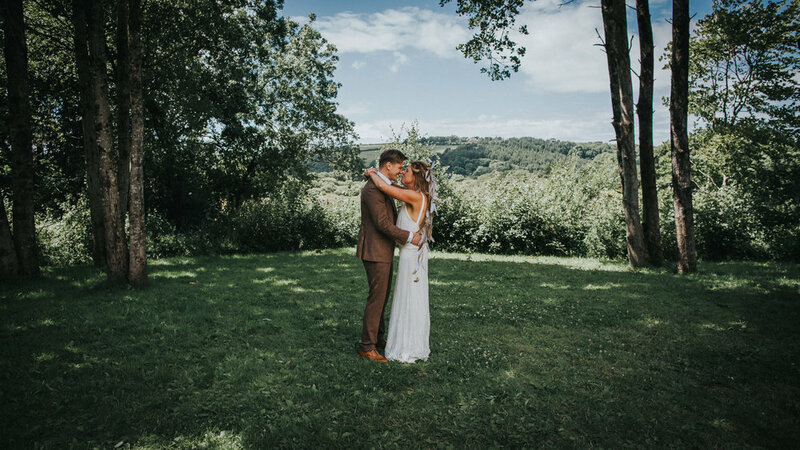 While you are legally tying the knot, your guests make their way to the giant hat tipi where a humanist wedding ceremony kicks off your wedding celebrations. 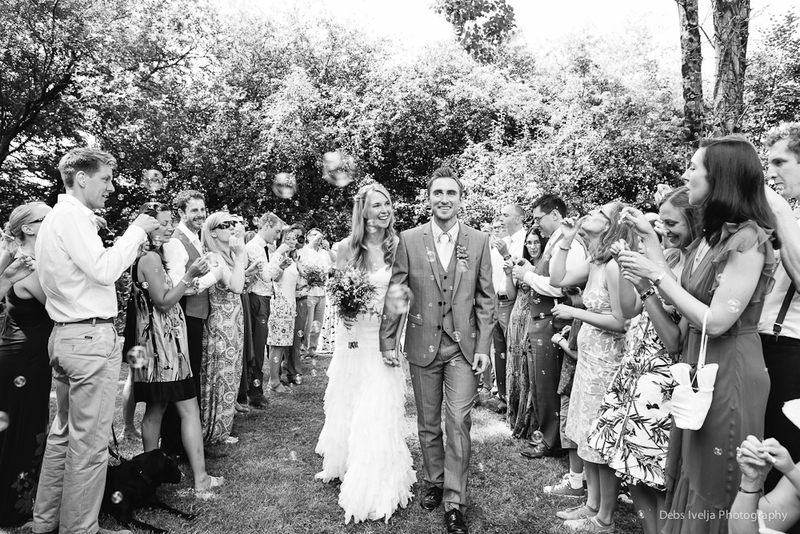 This is your moment to shine - you can make this ceremony as personal and unique as you like. Outside we are waiting for you on the terrace with drinks poured and canapes ready to pass around. 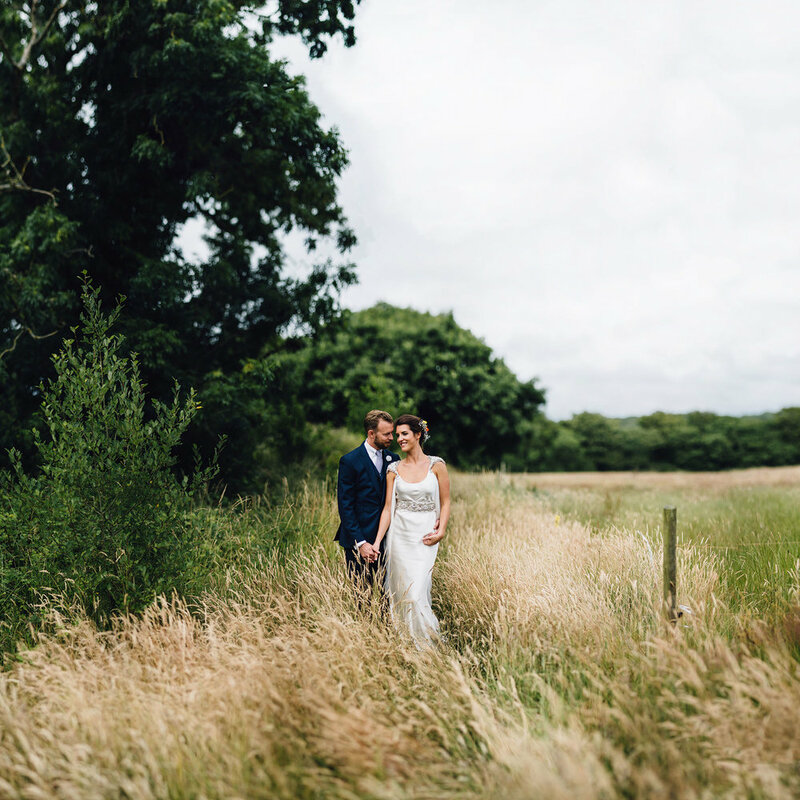 Just a few steps away is the lodge barn where long tables are laid out for a delicious tea party with vintage cakestands, candelabras and freshly picked wild flowers. All of your guests tuck into dainty sandwiches, mini quiches and scrumptious cakes and macarons. We keep the teapots topped up and the wine flowing throughout. 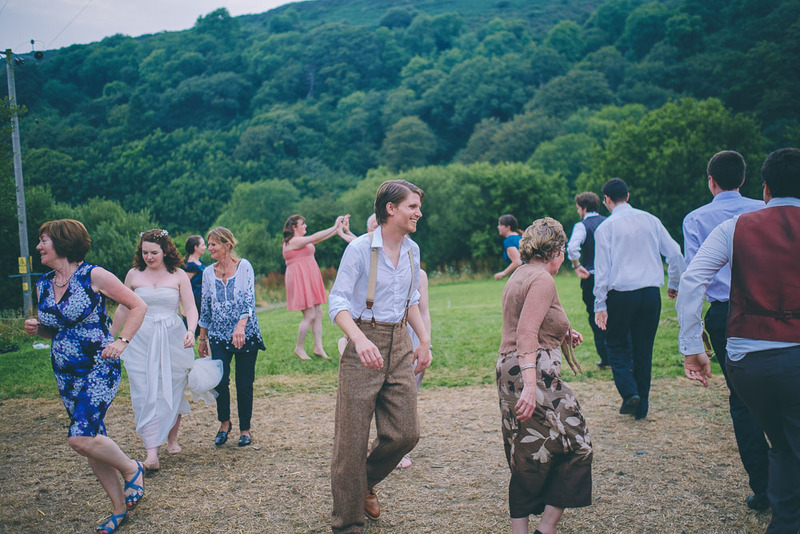 The bar is stocked at the cedar barn in the farmyard and the band are starting up, so everyone heads up for an evening of dancing and laughter. Out on the terrace, firebowls and lanterns are lit creating a wonderful glow. The local butcher arrives with a freshly roasted hog, and supper is served with a selection of beautifully dressed salad leaves and edible flowers picked this morning from the fforest gardens. While everyone is eating the DJ sets up, so it’s back into the cedar barn to carry on the dancing. When the partying is over, it’s a short stroll past the croglofts back to your dome where you fall into bed. 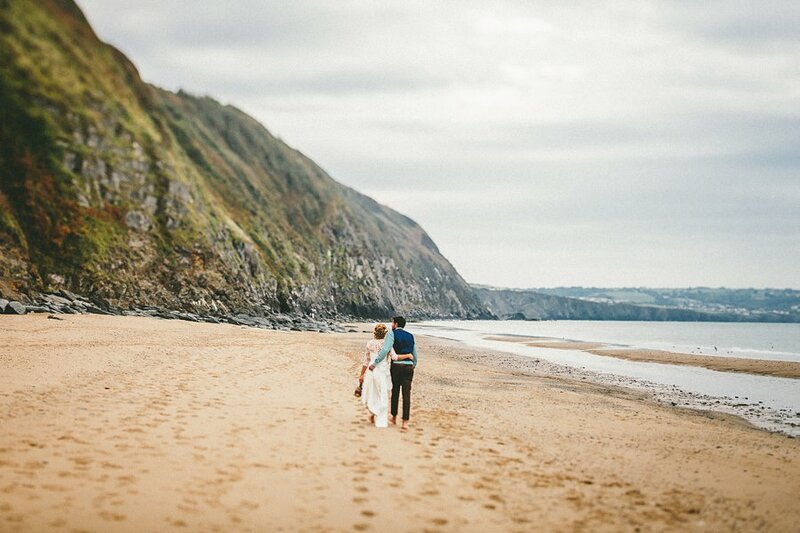 The tea is brewed and breakfast laid out for any early risers, but we expect to see you and the majority of your guests mid-morning for a slap up Welsh brunch barbecue breakfast before you say goodbye to your guests and head back home to married life!